Erissery is one of the main dishes served during Onam sadya. As I have already posted mathanga cherupayar erissery (pumpkin cowpeas erissery), I wanted to share erissery with yam and red cow peas. I make this often in my home as it is one of our favorites. It is easy to make, filling and very delicious. As onam is just a few days away, I will be sharing many more Kerala delicacies in the days to come. Today we will learn how to make chena vanpayar erissery following this simple and easy recipe. Scrap the skin and chop yam into medium sized cubes. Apply oil on your hands before handling yam to prevent itching. Wash and soak red cow peas overnight. Pressure cook adding little water, 1/4 tsp turmeric powder and a little salt for 3 whistles or until soft. Grind coconut, shallots, green chilli, cumin seeds and garlic to a coarse paste. Cook yam in water (just enough to cover the yam) with salt and turmeric powder. Once the yam is cooked, mash it slightly. Add the cooked cow peas and the ground paste to the yam and cook for few more minutes until the raw smell of the paste goes. You may add 1/4 cup of water, if it is too dry. Heat 2 tsp of coconut oil, add mustard seeds, when it splutters, add red chilli, shallots and curry leaves. Saute on medium heat until shallots turn golden brown. Pour it over the erissery. Heat another 1/2 tsp of coconut oil and fry the grated coconut until golden brown. Add it to the erissery and mix well. 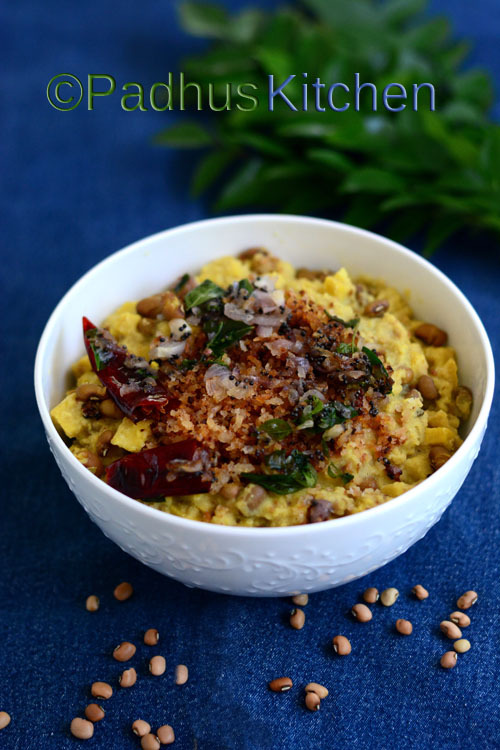 Serve with rice, rasam, sambar or puliserry. Note - You can skip garlic and shallots, if you do not prefer. You can use black eyed pea instead of red cow peas.